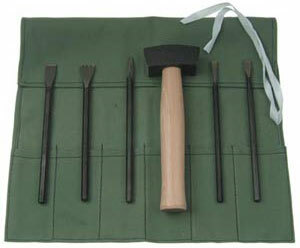 * This 6-piece carving set includes hand-forged tools made of the finest quality steel tempered for soft marble and alabaster. * Each tool has long-lasting cutting edges. * One (1) carving hammer of soft iron. * Comes in a canvas roll.